In Feng Shui, clutter represents postponed decisions and the inability to move forward, and clearing that clutter makes room for good things to find you. 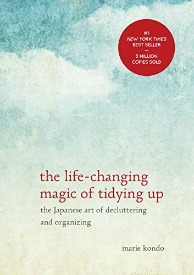 Marie Kondo takes clutter-clearing to a whole new level in "The Life-Changing Magic of Tidying Up: The Japanese Art of Decluttering and Organizing." Her "KonMari Method" of mindful tidying leads to lasting results. With detailed guidance for determining which items in your house “spark joy” and which don’t, this international bestseller will help you clear your clutter and enjoy the unique magic of calmness that a clutter-free lifestyle will inspire. Click here to buy copies for yourself, and to give as gifts.